The Sydney Roosters have been the top target of rival club fans for decades now. Probably ever since the club Chairman became the first major sponsor back in the day. City Ford became the pioneer club of sponsorships, rather than the chook raffles and small Leagues Club handouts prior to that. They also were the first club to re-invent their Leagues Club and for the football club to be the controller of the Leagues Club, rather than the other way around. This all set the place up to be a much more business-like entity, even in the 1970s. Bob Fulton, almost the last captain coach ever, ran a professional footy club operation, with players required to train during the day – unheard of in its time. Players had to have training friendly jobs, and only the top players had the benefit of both these jobs and the top end training that Fulton and his assistants provided. With some notable periods of exception, the old Eastern Suburbs Roosters have adapted pretty quickly to the many professional and business changes that have swept into, and out of, the league landscape, maintaining a very high profile as a top tier club. It’s no surprise that people still look on with a mix of awe and surprise at how they maintain those lofty heights. And, of course, for the wretched rivals, they are fodder for savage accusations. The salary cap issue leads the way in modern times: how can they possibly fit all those top players under the cap? Firstly, I know that the relationship between NRL headquarters and the Roosters has been frosty, maybe not at the moment as I’m not there anymore, but certainly a few years back. To think that the salary cap auditors, or the NRL top dogs, would cut the Roosters some slack and turn a blind eye to overpayments is laughable when you know the inside workings of the place. Secondly, those who cry foul don’t know what players are receiving. At times, I didn’t even know myself as head coach. So how on earth is someone outside the place going to offer pinpoint accuracy in assessing their player spend? They don’t. It’s all a guess or driven by fictitious reports in the media. On that score, I can tell you that at times the number on some players’ contracts, at plenty of clubs other than the Roosters, were wrongly assessed by media people by literally hundreds of thousands of dollars. The real truth about the Roosters’ success on the field is largely based on two key factors. The first is a long-term plan that has paid off in spades. 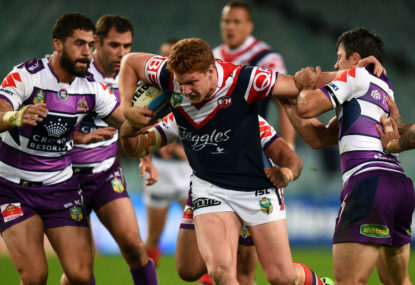 Since Peter O’Sullivan has moved from Melbourne, the Roosters have followed a pattern that has proven itself over and over, unlike other clubs that have either had a plan and failed to stick with it, or were seriously flawed in the long term. It’s been O’Sullivan who has selected players both for recruitment and largely for removal from the playing roster. Not the head coach. And not the CEO. Not even the chairman, as perhaps had been the case in the past. Well, almost not. He did chat with the head coach, in my time there, on most transactions. O’Sullivan recruited the best available players coming out of under 20s to go with the very best kids he had hand-picked and developed from 17 and 18 years old. The NYC players were offered two-year deals at the minimum pay allowed, but the two years to some who were rejected by their original clubs was real security and a shot at being a full-time player was a lure. Daniel Tupou was one of those who wasn’t being selected in Parramatta’s NYC team regularly but after a one year course in footy coaching at Newtown, winning them a competition, he was ready for the NRL. And State of Origin. And a premiership. Of course, some were paid well over that minimum, but still way below established first graders if he deemed them to be immediate or nearly a chance of cracking NRL level in their first year. Jared Waerea-Hargreaves and Roger Tuivasa Sheck are top examples. Pearce and Friend were recruited at 16; Mitch Aubusson and Boyd Cordner at 17. Dylan Napa was picked up without much of a fight from other clubs; Kane Evans was locked into a long-term deal and has taken a long time to crack the NRL, as O’Sullivan predicted. Still, he stuck with him as he battled to grow into that massive frame. Shaun Kenny-Dowall was a blow-in on a trial. Sam Moa was rejected by other clubs and went to Hull in the Super League and returned to do his best at a rebirth in the NRL. The ‘trick’ to it all is this. If you can get as many ‘underpaid’ players as possible into the top 25, you can manage to increase the pay of those who do well so as to retain them and still have the money to buy in some ‘bankers’ with experience and proven class – SBW, James Maloney and Michael Jennings in recent seasons. That premiership-winning season must have been very a squeezy fit, I admit. But the most significant part of this system O’Sullivan has employed is that it requires great development staff to make it work. The head coach needs to have superb development qualities, and so does his whole staff to elevate those younger and less fancied players into NRL standard quickly. Just count how many players the Roosters have in their squad who have never played NRL for another club, were rejected before they came to the club, or had no real top quality credentials before arriving there. Few others can match the skill and accuracy of O’Sullivan’s selections, nor the quality of professional servicing of their players by the Roosters coaching staff.